Buy a brand-new, fuel-efficient Toyota Prius hybrid. Put a 20% down payment on a nice four-bedroom, two-bathroom house in Warren Buffett's own Omaha, Neb. Tour Europe. Luxuriously. For a month. That's right: In 2010, there were 2 million weddings celebrated in the United States -- everything from backyard barbecue nuptials to extravaganzas in Cinderella Castle -- with the average total cost of $25,000 to plan it, ceremoniously get hitched, and have a reception. And that number grows higher each year. No matter what your idea of wedding bliss is, and whether you're a bride- or groom-to-be, this is a trend worth noting because it can put money in your pocket. Economy? What Economy? It's My Wedding We're Talking About! Between reality TV shows like "Say Yes to the Dress," worldwide coverage of the most recent royal wedding, and popular wedding-themed movies like The Hangover and Bridesmaids, engaged couples are bombarded with ideas and high expectations for their own big day everywhere they turn. One place they're apparently not turning, however, is to any news channels. Surprisingly, the recent economic downturn has not been a huge deterrent as couples plan their weddings. "Brides remain committed to planning a luxurious, memorable event," says Carley Roney, editor-in-chief of the XO Group (XOXO), the company behind popular wedding website TheKnot.com. "[They] are willing to spend despite the state of the economy. In fact, approximately one in five brides are spending more than $30,000 on their wedding, and 12% of brides are spending more than $40,000." And the nuptials themselves are far from the only focus of the wedding industry. 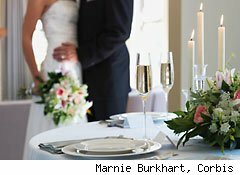 There are a ton of things to spend money on before the big day even arrives: bridal shower(s), gifts, bachelor/bachelorette parties, rehearsal dinners, and anything else that a couple might decide will really make their wedding (and the time leading up to it) a special and unique experience for their guests. Blue Nile (NILE): While couples are willing to drop a lot of cash to have the perfect wedding, they're rarely willing to do it without first doing a ton of research. Thus, consumer education is a key component of success in the wedding industry, and Blue Nile delivers. Besides the jewelry it offers in a variety of styles and price ranges, its site also makes it easy for couples to feel confident about their purchases. An entire section of the website is dedicated to education about the different aspects of the jewelry Blue Nile offers, including diamonds, gemstones, and metals. Couples can explore these topics using articles, video tutorials, or live chats with expert consultants. XO Group: In addition to XO Group's nationally circulated wedding-planning magazines, one of its main websites, TheKnot.com, exists solely to help couples plan their big day. With rich editorial content inspired by the company's print publications, personal planning tools, a searchable local vendor database, and extremely active online message boards, TheKnot.com provide brides with a one-stop shop for information on etiquette, trends, and -- of course -- the best ways they can spend their money. Discovery Communications (DISCK): One of Discovery Communications' television networks, TLC, currently airs five shows exclusively about weddings, as well as four others (such as "Cake Boss") that frequently deal with weddings. TLC was one of the first networks to bring this trend to television 10 years ago, and its strong focus on continued development of wedding-related shows proves its success for the company. Viewers love them, and as the number of weddings rises, so will the audience for shows like these. That's the beauty of the wedding industry: it's never obsolete. As long as there are new lovebirds in the world, there will be consumers soaking up as much information as they can -- and shelling out the cash to match. Motley Fool contributor Amanda Buchanan owns shares of XO Group. Motley Fool newsletter services have recommended buying shares of Blue Nile and Discovery Communications.